After more than a decade of working on animated projects, including directing Balto and The Prince of Egypt, Simon Wells graduated to live-action filmmaking in 2002 with his adaptation of H. G. Wells' classic science-fiction novel, The Time Machine. 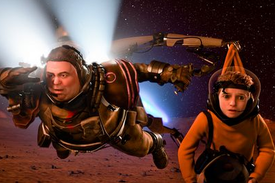 This week, he comes full circle with the release of Mars Needs Moms, an animated film that utilized the talents of a very live ensemble of actors and transformed performance-capture footage into a sprawling, epic story of a boy who journeys to Mars to rescue his mother from Martians who are interested in her. Boxoffice caught up with Wells last week via telephone to discuss Mars Needs Moms. When was the movie shot in the timeline of Avatar's success? We started writing it in 2007 and obviously Jim had been going for some time by then on Avatar. In fact a number of our crew, even some of our troupe of actors worked on Avatar. So we knew a little bit about what was going on, although they were keeping very quiet; even friends of mine, Rick Carter for instance, wouldn't breathe a word about what the design on Avatar actually looked like. But we sort of knew roughly what was going on. But we shot the actual performance capture before Avatar came out; we were shooting in March and April 2009. Why was performance capture the appropriate way to tell this story? You could have done this as a live-action actor in a green screen or blue screen [environment], but the great advantage you have with motion capture coming from the directing point of view is that you have complete control of the cinematography and you do that after the fact. So you can concentrate on getting the absolute best performance out of your actors to begin with, and then as a separate part of the process you can refine your cinematography—and you're not boring the actors with all of the technical parts, like "you've got to hit your marks and you got to time it just right so this camera dolly move arrives at the same time as you do in this piece of performance." And you're not frustrating the camera people by sitting up some complicated camera move and then the actors doesn't deliver at the exact moment, or the actor does a perfect take, but they're two inches off their mark and their out of focus. So in terms of the practicality of shooting and of bringing the thing to the screen, it's a tremendously controllable technique. Then also from a practical point of view, trying to shoot this movie with a real 10-year-old kid would have taken a very, very long time, and I'm not sure whether a real 10-year-old could have really produce the emotional range that Seth produced in this movie. And the other thing altogether is we only had four human characters in the entire movie and everybody else was something that certainly could not be a person in rubber suit. So there wouldn't be much point in shooting a human being against green screen and doing all of the rest of the movie CG because you're already talking about 95 percent of the movie being in CG. When you have a movie that is supposed to be a ride, something fun and exciting, how do you make sure the technology doesn't overwhelm the story and the performances? I think for me directing, my watchword was always coming back to story, so all of the design work related to the function of the story, even down to the way in which the set was constructed, I actually conceived a screen direction plan which would derive from the story. So whenever we were moving towards danger, we are moving in one direction and whenever we were moving away from danger, there were some small variations in that, but it's largely true to the movie. And so the design of the sets was derived from that, and therefore the style in which we shot the movie including how we were conceiving the three dimensional use of the camera. And the actors' performance follows the story, so in a sense the story is king and is the key to what everything else does. So it's not so much that those things would overwhelm the story as they're brought up entirely in service of the story. Seth is an amazingly good actor. He's a much-underused actor, and a lot of it has to do with the fact that he's kind of a short guy; he's not someone who can be a leading man in a movie. So this is really a chance for him to get outside the physicality of what he looks like and perform as a character that is very different in look, but he's absolutely capable of providing the characteristics of. Between him, Dan Fogler and the actress who plays Ki, Elisabeth Harnois, you make some unconventional casting choices, given the usual tendency to go for more recognizable actors as the voices for characters in animated films. How difficult was the process of finding the right actors to fit into these roles? We had a terrific couple of casting directors, Victoria Burrows and Scott Boland, and they—well, actually Seth we ran into when we came and visited the set of A Christmas Carol, when we were writing, and we were just chatting to him because we always liked him as an actor and admired him. And while we were talking to him, it suddenly kind of hits us like a lightning bolt, oh my God—this is Milo! We are talking to the guy that we want, just his nature, his character; we want to sort of bottle that and put it into our Milo. And then someone like Dan, I had honestly never heard of Dan before, and Scott and Victoria read our script and they said "this is the person you want, Dan Fogler." They showed us a bunch of clips from various thing he'd been in, on Broadway and then we watched a couple of his movies, and realized that had an extraordinary range and was a very funny guy. So that was entirely their discovery. And Elizabeth Harnois, she'd been around for a really long time, actually since she was in her teens I think, but we did an open casting session and the studio was very nice and said, "look, just find the right person for the role. Don't feel that you have to have a name actor per se." And Elizabeth came in just immediately able to speak Martian. She actually convincingly spoke it as her first language and then struggled to speak in English. And we just thought "nobody else has done that." We had a number of other actresses who came in and could kind of do the martian thing, but they couldn't make it feel like that was their first language. How careful did you have to be about the intensity level of this story, because it does need to have real stakes, but obviously you want it to be fun—or at least not terrifying—as well. Yeah, it's more of a sort of Goonies action-adventure kind of level than tremendously safe family fare. Part of that was that it always appealed to me as a kid, and I know it appeals to Wendy and my kids. They were eight and ten at the time when we started writing this, and we didn't write anything that we figured would be too intense for them. [But] I think it's important to have some degree of real jeopardy or real drama in there. Kids like to be scared a little bit. I don't want to leave them traumatized, I don't want to leave them having nightmares, but some of its stuff is a bit scary. And Pirates of the Caribbean has scary stuff in it, but kids love it. Where do you draw the line between creating an accurate depiction of the science on Mars and just telling a good story? We didn't perfectly reproduce the acceleration due to gravity that you get in one third of the gravity you get on earth because things would have fallen in a rather strange slow-motion fashion, and I think it would be more confusing to the audience; I don't think the audience would have said, oh, that's because there's one-third gravity. They would have said, why is that person moving in a weird way, and why aren't things falling properly. It would just look like the animation was wrong. So to a certain amount, it was simplified out to keep it accessible. There was no real need to be absolutely scientifically accurate. And certainly this is a fantasy story, so we were stretching the edges. Nhân sâm là một trong những loại thảo dược tự nhiên, có mặt ở rất nhiều quốc gia trên thế giới như Nhật Bản, Hàn Quốc, Hoa Kì... Trong các loại nhân sâm kể trên thì nhân sâm hàn quốc luôn được hàng triệu người trên khắp thế giới săn lùng và tìm kiếm bởi những giá trị tuyệt vời. Từ xưa đến nay những công dụng của loại nhân sâm này vẫn được mọi người lưu truyền và ứng dụng vào trong đời sống đặc biệt là chăm sóc sức khỏe của con người. Củ nhân sâm Hàn Quốc chính là nhân sâm Hàn Quốc ở dạng tươi chưa qua sơ chế thành các sản phẩm. Củ nhân sâm Hàn Quốc có những vai trò và tác dụng vô cùng to lớn đối với con người.